BUFFALO, N.Y. -- Senior guard Cierra Dillard continued her outstanding play for the Bulls last week as she helped UB collect a win over Niagara and gave #3 Oregon all they could handle in a loss on Sunday afternoon. 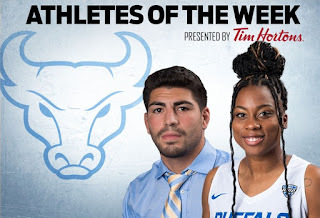 Dillard was lights out for the Bulls as she finished the week averaging 28.5 points, 5.0 rebounds, 4.0 assists and 2.5 steals while shooting 46.3% from the floor. On Wednesday night, Dillard led the Bulls with 25 points, six rebounds, four steals and three assists across 32 minutes while going 9-for-17 from the floor and 3-for-6 from behind the arc in UB's 88-61 win. On Sunday night in a showdown at #3 Oregon, Dillard proved she is one of the best players in the country as she went off for a season-high 32 points, five assists and four rebounds in 40 minutes of work as the Bulls fell 102-82 on the road. The 30-point effort for Dillard was the third of her career as she has now notched 20+ points in each game this season and seven straight overall dating back to last season. In her last seven games, the senior is averaging 27.6 points/game.